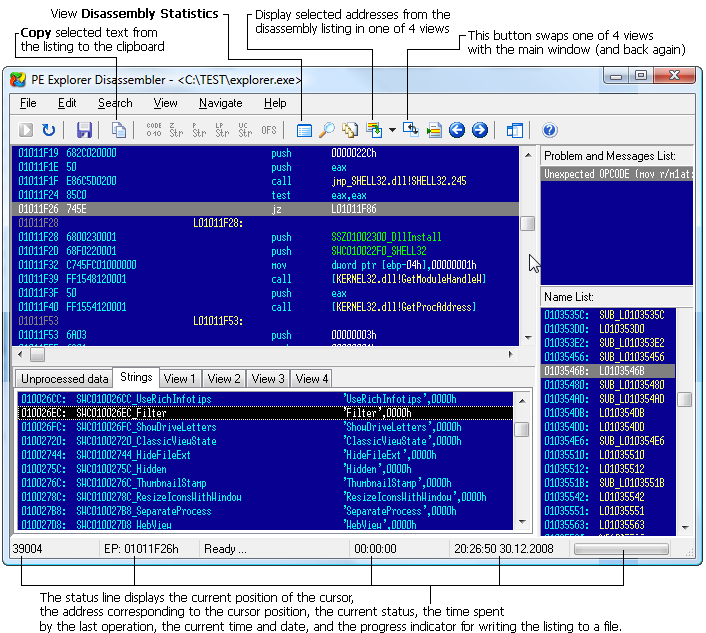 PE Explorer Disassembler. 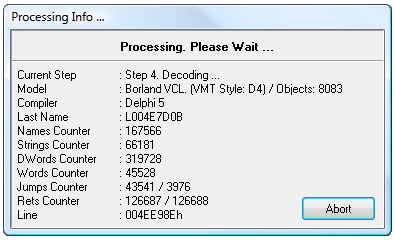 Reverse engineer asm source code exe 32-bit dll Delphi exports procedure parameters. I have been using PE Explorer for a while, and am very impressed with the latest version's functions, especially the PE Explorer Disassembler. Among the products I tried (editors, dll showers, hex editors, disassemblers etc.) it is one of the best because without any long studies and a little skill and patience you are able to begin to understand the way a program works and how (and it was for me the most important). One of the reasons that I bought PE Explorer was the Disassembler. Good stuff. The other reason is the GUI — it is really useful when trying to get an overview over a given PE file. 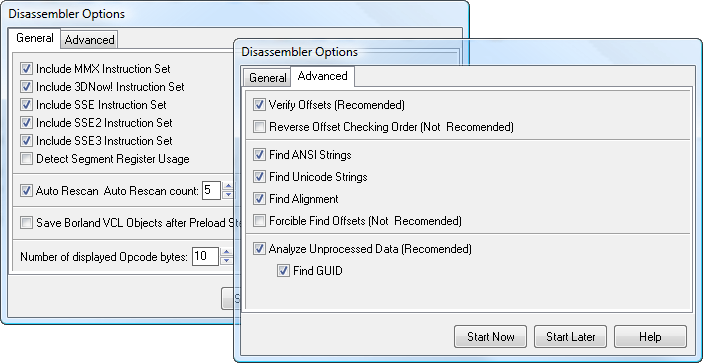 The PE Explorer disassembler is designed to be easy to use compared with other disassemblers. To that end, some of the functionality found in other products has been left out in order to keep the process simple , fast and easy to use. The PE Explorer disassembler assumes that some manual editing of the reproduced code will be needed. To facilitate additional hand coding, however, the disassembler utilizes a qualitative algorithm designed to reconstruct the assembly language source code of target files with the highest degree of accuracy possible. While as powerful as the more expensive, dedicated disassemblers, PE Explorer focuses on ease of use, clarity and navigation. We just made a good disassembler at a reasonable price. It will save you hours of time and it's easy to use! Once you pressed Start Now, the disassembly process begins by identifying the compiler used to build the target file. Forehand knowledge of how a compiler puts files together improves the guesswork involved in determining the data allocation patterns within the target file. Moreover, given this information, identifying most of the objects, procedures, variables, types etc. of the target file can be achieved with a very high degree of accuracy. Disassembling files larger than 1 Mb in size can take several minutes depending on the capabilities of your system. Generally, each byte of a target file requires 40 bytes of memory for processing. For example, a 1 Mb file would require 40 Mb of processing memory, a 2 Mb file — 80 Mb and so on. After all processing has been completed, the disassembler displays the resulting source code for the target file. This output can be manually edited or saved to disk for future reference. Although the customized modeling performed by the PE Explorer Disassembler does increase processing time, the result is a dramatic reduction of incorrect opcode translations. We think you will agree that that the extra time needed to achieve this high level of accuracy is justly compensated for by the time saved when hand correcting the output. In this case, the space for storing the variable MyData will not be allocated physically in the data section, but the virtual size of the data section containing it will be increased by a WORD value. It also happens that variables declared in this fashion will result in lost megabytes of virtual space for the containing data section. At present, due to the features of the internal data structures in PE Explorer and for the reasons cited above, mismanaged memory allocations are excluded from disassembly. Otherwise, the memory expenditure required to process target files could grow astronomically. Currently, each byte of incoming data requires 30-40 bytes of memory to process.